Summary: Northern California, during the violent end of the 1960s. At the start of summer, a lonely and thoughtful teenager, Evie Boyd, sees a group of girls in the park, and is immediately caught by their freedom, their careless dress, their dangerous aura of abandon. Soon, Evie is in thrall to Suzanne, a mesmerizing older girl, and is drawn into the circle of a soon-to-be infamous cult and the man who is its charismatic leader. Hidden in the hills, their sprawling ranch is eerie and run down, but to Evie, it is exotic, thrilling, charged—a place where she feels desperate to be accepted. As she spends more time away from her mother and the rhythms of her daily life, and as her obsession with Suzanne intensifies, Evie does not realize she is coming closer and closer to unthinkable violence. 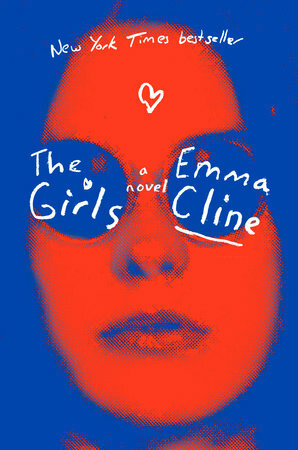 I hardly know where to start talking about THE GIRLS by Emma Cline. This book has received some major praise in the past few months, and who am I to argue with that? The story takes place in the 1960s and will remind some readers of the Manson Family cult. In fact, I was expecting a fictionalized account of that story, but what I got was so much more. THE GIRLS tells the story of Evie Boyd, a fourteen year old girl who notices a group of girls in a park and immediately becomes entranced by them. While Evie certainly has her fair share of freedom, she becomes caught up in the wonder of these girls. They just seem to have a certain way about them -- their unique style of dress, their wild nature, and their no care attitude. Evie is especially drawn to Suzanne, one of the older girls in the group; and Suzanne introduces her to the cult and their charismatic leader. They live in seclusion in the hills of Northern California; and despite the raggedy nature of the ranch, Evie is mesmerized. Evie begins spending more and more time away from her family, and she eventually gets caught up in this group and their violent behavior. Readers can't help but feel as if Evie was a member of the Manson Family or a group that is eerily similar. I honestly was expecting a story about the brutal crime but was pleasantly surprised that the novel was more about the dynamic of girls. (I guess the title of the novel could have been a clue!) The novel was extremely insightful, maybe even brilliant at times; and it is a compelling (albeit disturbing) read. I always credit the author Megan Abbott for "getting" girls and teen behavior, and I have to say that Emma Cline is definitely another writer who gets it! In fact, Ms. Cline is a terrific author -- one that creates memorable characters and a compelling storyline. It's hard to believe that THE GIRLS is her first novel because it's so polished and well written. The way she portrayed the longing that Evie felt for Suzanne was so spot-on, and I suspect that readers will actually understand Evie's behavior... even though at first glance it seems so strange. I have read quite a few books about the Manson Family, and I honestly have always wondered how a group of people could be so willing to follow a crazy man. It really wracked my brain. What I will say is that THE GIRLS helped me to understand the dynamics of girls who wanted to belong to a group so badly that they were willing to do almost anything. It's a scary (and sad) thing that the desire to be part of a group is that strong for some people. Needless to say, THE GIRLS would make an excellent book club pick. Almost all of the women in my group have daughters, and I think it would be especially interesting to talk about these girls' behavior with them. There is a reading guide with twelve interesting questions that might help to jump start your meeting. Some of the themes you might want to explore include family, peer pressure, friendship, insecurity, desire, power and acceptance. Overall, THE GIRLS is one of the best books I've read this summer. Don't miss it! It is definitely deserving of the buzz surrounding it. I heard when they gave her the deal for this book they gave her another book deal. She must be feeling some pressure! You're so right with your comparison of Cline to Abbott! And I was pleasantly surprised by this one too! I've got to read this! I've always wondered how people can fall for cults like that. I loved this book too! Helter Skelter is one of my favorite books. I felt like this book gave me some insight into how the Manson Family girls thought. I loved Cline's metaphors too. I listened to the audio version, which was great but I wish I had the print version so I could have marked some of my favorite metaphors that she used.